This morning’s sports headlines announced that a “Legends Row” of greatest Maple Leaf hockey players would be established outside the Air Canada Centre. In keeping with that announcement, here is my nomination, i.e. the already legendary Leaf, “Mr. Maple Leaf,” Turk Broda. Regarded as perhaps the best clutch goaltender of all time, Walter “Turk” Broda was “Mr. Maple Leaf” for 16 seasons, with two years lost to Canadian armed forces duty in World War II. Walter “Turk” Broda (May 15, 1914 – October 17, 1972) was born in Brandon, Manitoba to a Ukrainian family. He acquired the nickname of “Turkey Egg” during his school days in Brandon because of his many freckles. “Turkey Egg” soon became “Turk”, and the name followed him. Broda played his early hockey back home in Manitoba for the Brandon Athletics and Brandon Native Sons. He even got the Native Sons to the Abbott Cup final but lost to the Regina Pats. After stints with Winnipeg Monarchs, St. Michael Majors (he was the practice goalie when they won the Memorial Cup in 1934) and Detroit Farm Crest, he was given a shot at the NHL by the Detroit Red Wings. Turk had introduced himself to the Red Wings during an exhibition tour which brought the NHL stars to Winnipeg. A naïve but determined Broda only wanted to meet some of his NHL heroes. In addition he was given a training camp try out offer. Broda was an immediate hit in the IAHL and led the league in both wins and goals against average, both in the regular season and in the playoffs. Suddenly the pudgy goalie from Winnipeg was one of the most sought after commodities in the game. He was ultimately sold to the Maple Leafs in 1936 for the then steep price of $8000! It was money well spent by the Leafs, as he became the first, and arguably the greatest Toronto Maple Leaf puck stopper of all time. Broda quickly proved he belonged in the NHL, but by the beginning of the 1940s he was emerging as the league’s best. He led all goaltenders with 28 wins in 48 games in 1940-41 – the same year he captured his first Vezina trophy. In 1941-42 he followed that up with his first Stanley Cup. It wasn’t a likely Cup victory either. Down three games to none and on the verge of defeat in the finals against Detroit, the Leafs, thanks in large part to the great goaltending of Broda, stormed back and unthinkably won 4 straight games to capture the championship! Broda’s reign as the top goalie in the league was put on hold in 1943 when he spent 2 and ½ years in the military during World War II. He would return late in the 1945-46 season. Broda’s second tour of duty with the Leafs proved to be more successful than the first. The Leafs emerged as one of the greatest teams of all time. 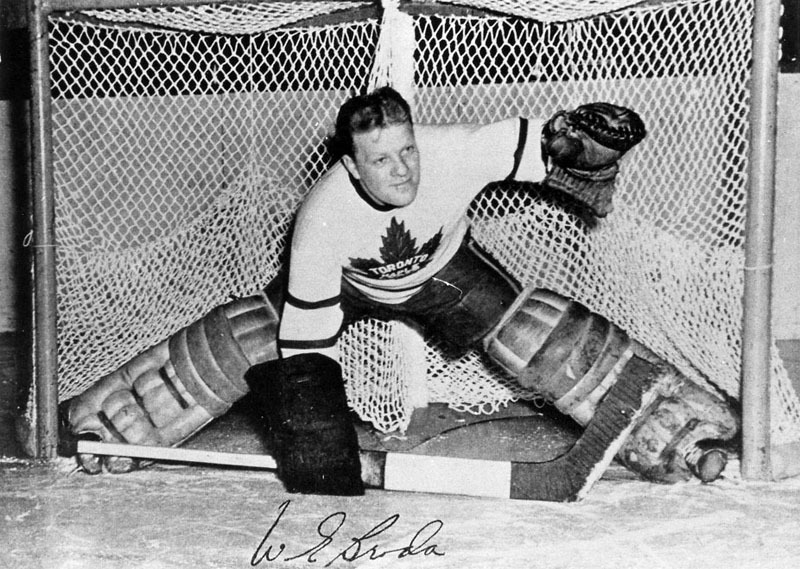 Broda would be the puck stopper in each of the Leafs Stanley Cup wins in 1947, 1948, 1949 and 1951. He was very good during those regular seasons, but come playoff time he somehow was able to take his game to a new level – he led the entire league in wins and shutouts in each of those Stanley Cup years, and in goals against average in 3 of the 4. Broda’s own explanation for his playoff success was simple. In that comment you can see Broda lived up to the standards of the stereotypical goaltender – a touch on the crazy side. Mind you goalies back then stopped fast flying rubber bullets with his maskless face for a living, so his craziness can be somewhat understood. A publicity shot of Broda eating a hamburger during the “Fat” joke episode. One of the most famous and publicized incidents in Turk’s career was his constant “Battle of the Bulge.” The often witty though short-tempered Turk had the Toronto media press’ attention as he and Leaf boss Conn Smythe constantly battled over Turk’s playing weight. Smythe once ordered Turk to cut his grocery intake enough to lose some weight. He wanted Broda to play at 190lbs, down from 197. Smythe then brought up minor leaguer Gilles Mayer and brought Al Rollins from Cleveland Barons (AHL). The Toronto press had a field day and called the goaltending trio “The Long” (Al Rollins 6’2″), “The Short” (Gilles Mayer 5’6″) and “The Fat” (Turk Broda). The whole event turned into fantastic publicity stunt, with Broda leading the way. The press knew all about his diet of grapefruit and soft boiled eggs. And of course the press was there when Turk tipped the scales at 190lbs before game day. It was front page news! Broda’s career statistics are amazing: over 300 wins, (in an era when seasons were only 48-60 games long) 62 shutouts, and a lifetime GAA of 2.53. 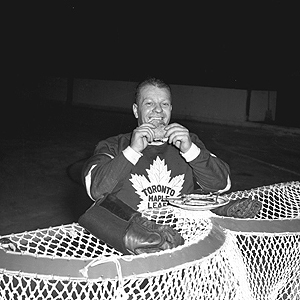 He won or shared 3 Vezina trophies back when the award was given to the goalie with the fewest goals against – a truly amazing accomplishment considering the Leafs of the 1940s were known more for their offensive production than for their defensive awareness. It was in the playoffs where Turk’s star shone the brightest. With 5 Stanley Cup rings, he is without doubt one of if not the greatest money goalies of all time. With 13 more playoff shutouts and GAA under 2.00, Turk Broda was simply a phenomenal post-season puck stopper, which was necessary for the Leafs dynastic teams of the 1940s. Turk retired in 1952 as he approached the age of 38. He became a junior coach and led the Toronto Marlboros to back to back Memorial Cup championships in 1955-56. He would be welcomed into the Hockey Hall of Fame in 1967, but passed away just 7 years later at the early age of 58.